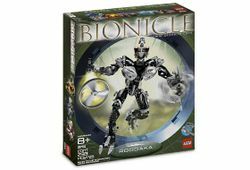 8761 Roodaka is a BIONICLE set released in 2005. In the BIONICLE storyline, she is a scheming, duplicitous manipulator who is best known for being the Viceroy of the Visorak hordes. Roodaka was released in 2005 as one of the Titan sets. Interestingly, her Rhotuka ripcord rather than her launcher was attached to her right arm, and by sliding the launcher construction itself forward one could fire the silver Rhotuka spinner forward at high velocity. An axle held it in place on the arm otherwise. Her Catcher Claws tended to remain in a closed position unless spun, in which case they would expand and open. She could be combined with Keetongu to create a model of The Shadowed One, or with both him and Sidorak to create Voporak. During a rite of passage, Roodaka had to climb a living mountain on her island with a partner, possibly her friend. They were midway up when her companion got caught in a rock. He cried out for help, but Roodaka took her first gamble that day and abandoned him. Letting the mountain devour her partner, Roodaka used the distraction to climb to the top. After the Kanohi Dragon was defeated on Metru Nui, it was taken to Xia, where Roodaka welcomed it personally and met Toa Lhikan, mentioning that on Xia, it would be no worse than an "ill-tempered pet." What Roodaka did after this is unknown, but over a thousand years before the Great Cataclysm, Roodaka traveled to receive training from the Dark Hunters. She wanted to learn their techniques, but without actually becoming one. The Shadowed One refused almost instantly. Then, Nidhiki approached her, trying to get her to help him leave the Dark Hunters. She pretended to agree, then told the Shadowed One what he was planning. She then said that she would keep him there in exchange for training. The Shadowed One agreed, and Roodaka, with her Rhotuka, silently mutated Nidhiki into an insectoid monster. That was not the only time that Roodaka aided them, though. Her spinner was thought to have been used in the making of the being "Silence", which she gave to the Dark Hunters as a gift. Soon afterward, Roodaka entered the service of the Brotherhood of Makuta. When the Toa Hagah rebelled against the Brotherhood, it was she who turned them into small Rahkshi-faced creatures that she called "Rahaga". However, her rival Sidorak took credit for the idea, and he was awarded with command of the Brotherhood's Visorak armies while Roodaka only got second-in-command. Sidorak named Roodaka as Viceroy of the Visorak, with hopes that she would become Queen, as he would gain status in Xia. When Makuta became imprisoned in Metru Nui he telepathically called out to his servants, and both Sidorak and Roodaka jumped at the chance to gain his favor. They captured the Toa Metru and Roodaka suggested they be executed spectacularly; the Rahaga were able to save them at the last minute, but not before the Toa were mutated by Visorak venom into bestial Toa Hordika. While Sidorak went off to conquer the city by force, Roodaka went to Makuta's prison and cut a small piece out of it for use in her schemes. She also had evidence planted for the Toa Hordika to find that stated that others had been destined to be the Toa instead of them; made all the more devastating by the fact that it was authentic (though it was later revealed to the Toa that they were the destined heroes after all; the evidence was made to deceive Makuta). When the Visorak reported that the Toa Metru were captured Sidorak ordered them to be killed. Roodaka told him otherwise and advised to make It more ‘legendary’. Sidorak then let the Toa Metru to be mutated and then be killed, a so called M and D (mutation and disposal known under the Visorak). Roodaka and Sidorak both looked how the Toa Metru were mutating into Hordika and then fell from high atop the Coliseum. When Roodaka stood in the sundial Chamber she held a part of the Prison of Makuta (later known as the Stone that represented Makuta on Mata Nui). She then reflected at the recent events and promised the Stone that Makuta was close to being freed. She then placed the stone into her breastplate. When a Visorak entered the room she became furious about the news the Visorak brought (the Toa had survived and were saved) and Roodaka smashed a pillar to dust. She than spat out the words of the Toa’s saviours as if it was poison: ‘Rahaga’. Roodaka also battled Krahka and defeated her. She then ordered Krahka to put the evidence all over the City, that the Toa Metru were not destined to be Toa. She also gave Sidorak the advice to unleash the Zivon into the City. When Sidorak was with the Visorak in the City Roodaka would sit occasionally at the throne of Makuta, overthinking her plots and schemes. When Vakama was caught by the Visorak Boggarak and tied by their webbing, Roodaka entered the room were Vakama was locked up. They then had a small conversation and than Roodaka said she had a proposal for Vakama. Vakama refused at first, but she convinced him that from listening there could be no harm. She then used her talon to cut the webbing off Vakama. Roodaka then showed Vakama the ruins of Ta-Metru. She then talked with Vakama over Sidorak, while not attempting to hide her disgust of Sidorak. They then talked about his leadership and Vakama was worried the Visorak Boggarak would tell Sidorak about this discussion he had with Roodaka. Roodaka told him that they were loyal to her. She then told Vakama she wanted him to lead the Visorak Horde. While Vakama was over thinking the words Roodaka said, Roodaka told him that he required proof. She then ordered the Visorak to throw themselves over the balcony, who did it without questioning. She then told Vakama there are six ways to lead the Visorak Horde. When Vakama had captured five of the Rahaga he went to confront Sidorak, King of the Visorak. When Vakama told him he wanted to join Sidorak just laughed in disbelief, when Vakama showed him the five captured Rahaga he was to be let in, just according to Roodaka’s plan. Roodaka then took Vakama into Dume’s former inner chambers inside the Coliseum. Roodaka showed him the throne. When Vakama wanted to touch the throne Sidorak entered the room, warning him that he only was allowed to look at it and then thanked Vakama personally for capturing the Rahaga. Roodaka then proposed Vakama as her gift to Sidorak, a fitting master for the Horde. Sidorak refused the offer, Roodaka, prepared for such answer then said it was an engagement gift. Sidorak then went along and began introducing Vakama to the Visorak Horde. When the doors of the Coliseum smashed open, Nokama called for Vakama, Vakama hesitated. Roodaka, seeing what happened she then proved Nokama that he was on her side. Vakama, agreeing with her then demanded the Toa Hordika’s allegiance to him, the Visorak Horde and to the Visorak King (after numerous coughing of Sidorak). As Vakama gave the sign, the Visorak Horde surrounded the Toa Hordika. While the Visorak were aiming at the Toa Hordika, Roodaka grew impatient and ordered the Visorak to fire. Rotuka Spinners were then flying all over the battlefield. When Roodaka, Sidorak and Vakama heard a strange sound, Sidorak grew uncomforted. Looking over the side of the observation platform they saw Keetongu climbing the wall of the Coliseum. Shocked in disbelief, Sidorak and Roodaka went to finish Keetongu off. Roodaka blasted him with her shadow energy and sent him plummeting to the ground. Sidorak offered her the final blow, but she refused; it was only then that Sidorak realized that she didn't really wound Keetongu - she had only sent him into a blind rage. With Roodaka refusing to help him, Sidorak stood no chance against the enraged Rahi, and Roodaka became the Visorak's Queen in his place - as she had planned all along. She then confronted the Toa Hordika, who were vastly outnumbered; her plan was to kill them and absorb their elemental powers, using them to free Makuta. Instead, she got blasted by the five resisting Toa - and Vakama, who had rejoined them, threatened to fire as well. Roodaka warned that the Visorak would kill them all if she died, but Vakama (who still officially was the hordes' commander) ordered them to disband; they quickly complied, as Roodaka was a traitor who had killed their King. After that, Vakama fired, but ended up doing what Roodaka wanted (though in a much more painful way than she would have liked); the six elemental blasts were absorbed by the stone from Makuta's prison, and ended up shattering the prison, freeing Makuta. The first thing Makuta did was to teleport the defeated Roodaka out of the city and away from danger, though it appeared to many that she died from the assault. Rumors say that some time after the Great Rescue, she went back to Xia to climb The Mountain a second time to test her cunning. Roodaka secretly worked for both sides during the Dark Hunter/Brotherhood of Makuta War that erupted after the Vahi incident. 250 years ago she passed along some information to Piraka Zaktan as to forewarn him of a Brotherhood of Makuta attack on a Brotherhood base the Dark Hunters had taken over. After her supposed "death", Roodaka was found by the Dark Hunter codenamed "Tracker" (though he had to be restrained from killing her), and was brought back to the Hunters' base to "discuss her future" with the Shadowed One. However, the Shadowed One had caught on to her treachery and had made a deal with the Toa Nuva to eliminate her - but the Toa had something else in mind. Warning her that the Hunters were out to kill her and the Brotherhood wouldn't be far behind, they blackmailed her into reversing her mutation of the Rahaga. Now the Toa Hagah again, they have taken Roodaka into their custody and will presumably protect her from threats (though probably none too gently, given their shared animosity). Roodaka's time with the Toa Hagah didn't last long, as she was soon captured by the Order of Mata Nui to be part of a team consisting also of Brutaka, Vezon, Spiriah, Carapar and Takadox, and sent on a suicide mission against the Brotherhood of Makuta. The team headed to one of the southern islands in an attempt to find Miserix, the former leader of the Brotherhood of Makuta. When the team traveled to Stelt to purchase a boat for their travelers, Brutaka claimed he planned to use Roodaka as payment. Because of her involvement in Sidorak's death, the people of his homeland wanted her dead. However, before he handed her over, Brutaka knocked the trader out and stole the boat. Later in the journey, he revealed to Roodaka and her compatriots what they were after, as well as the reason why they were chosen: they were all expendable. Immediately after this, they were intercepted by a fleet of Zyglak, who had formed an alliance with Spiriah with the intent of attacking the island of Zakaz. Spiriah claimed control of the vessel, taking his teammates prisoner, and turned towards Zakaz. Roodaka tried to worm her way into his good graces, scheming as usual, but Spiriah was wise to her treachery and refused. Spiriah's plot was thwarted when, after destroying several Dark Hunter ships, his Zyglak fleet was destroyed by an army of the same species as Barraki Ehlek, who were loyal to the Order of Mata Nui. With Spiriah's defeat, they were then joined by an even more brutal teammate: Lariska, one of the most feared Dark Hunters. With Spiriah sufficiently intimidated, the group set off once more, reaching their final stop before arriving at Miserix's prison. There they picked up weapons for their mission, Roodaka claiming a new Rhotuka launcher. However, they were then attacked by the legendary entity Tren Krom. After a conversation with the horrible creature, during which Carapar was killed and the others given a nightmarish vision, the team was allowed to leave. Shortly after fleeing Tren Krom's island, the team arrived on the island of Artidax. Almost immediately after arriving, Spiriah was attacked by a hand of living sand. The hand almost pulled the Makuta underground before Roodaka used her mutation spinner to mutate the sand into a swarm of fireflyers. Vezon was the only one who recognized Lariska's saying about Kinloka. After an explanation of why he knew the saying, Vezon promptly asked if anyone wanted to help hunt down Vezok. They ignored him, and after some encouragement from Brutaka, and being tricked into believing he could be the leader of the Brotherhood if they succeed, Spiriah agreed to act as the team's guide of the island. The team continued on, with Spiriah as their guide. Before entering into a tunnel, Vezon stepped in front of Spiriah and pointed out a thin vine that had been set as a trap. After bypassing the trap, they entered a tunnel in the side of a mountain, and were trapped inside after Takadox cut the vine to trigger the trap, causing an avalanche that sealed them in. Roodaka then used her shadow energy to begin freeing herself from the rubble while expressing a desire to kill Takadox, but Brutaka insisted that they move onwards. As they continued on and entered a chamber, Vezon began to ramble, prompting Roodaka to yell at him to shut up. However, he then brought everyone's attention to the floor, which was moving from the thousands of Rahi on it. After Spiriah unsucessfully tried to get the Rahi out of the way using his Rahi control powers, Roodaka decided to mutate the insects that were approching from behind them - turning the insects against the victims of the attack. She then did this on the end of the bridge, creating an opening and leading the rush through it, discovering the chamber Miserix was held. When Miserix was freed by Brutaka and Roodaka herself, and Miserix grew wings, Roodaka attempted to persuade Miserix to turn on Brutaka and side with her. Miserix replied with a roar that sent Roodaka into a wall. Brutaka then took Roodaka, Vezon, and Lariska onto Miserix's back and flew off towards the north. Upon arriving at Daxia, Roodaka was imprisoned there. In "The Kingdom" Pocket Dimension, Roodaka was appointed as part of the ruling council of the Kingdom of the Great Spirit. When Takanuva entered the Coliseum, Roodaka and Turaga Takanuva were discussing the Panrahk that appeared within the Kingdom. In the Toa Empire Pocket Dimension, Roodaka works for the Toa Empire. She was responsible for mutating Toa Naho into an "interesting exhibit" in the Archives. Roodaka was the viceroy for the Visorak hordes, and is a member of the Vortixx species. She can tap into her dark side, something she learned through extensive training, and use it to wield non-elemental shadow energy from her fingertips. She carries an artificial launcher that allows her to fire Rhotuka with the power to instantly and permanently mutate its target into whatever form that she pleases - usually something disgusting or monstrous, though on rare occasions she may choose to mutate something back into its original form. However, this power is much less effective against natural shapeshifters, such as the Krahka. All of the Toa Hagah and Nidhiki were victims of this mutation. Note that the only thing that can undo this mutation is to be hit by another of Roodaka's spinners, and that the mutation seems to be unable to cause positive transformations, as all of the victims of her mutation are now in weaker forms than before being transformed. The sole exception to this, as far as we are aware of, is with the Toa Hagah. She also has enormous strength, being able to tear a buried troller out of the ground. Roodaka is also equipped with a catcher claw that allow her to catch the Rhotuka spinners of others, poison them, and fling them back. Note that in BIONICLE 3: Web of Shadows, Roodaka's Catcher Claw was depicted as a staff. Roodaka's Rhotuka launcher and Catcher Claws were taken from her when the Order of Mata Nui caught her. She has recently been given a new artificial Rhotuka launcher, made by Xia, by the Order. As Viceroy of the Visorak hordes, Roodaka schemed to take control and become their sole ruler. Where Sidorak leads the horde in grand battles, Roodaka prefers to implement more intricate, subtle plans. She can also quickly become irrational and violent; she has been known to throw Visorak off of high places for "making mistakes, not listening to her, refusing to look at her, or looking at her for too long". While neither Sidorak nor Roodaka trust each other, Sidorak has often proposed marriage to her (as marriage, being merely a political alliance in the BIONICLE universe, would give him influence with the Vortixx and give her power as the Visorak's Queen); she has always rejected his offers. This is a description taken from LEGO.com. Please do not modify it. (see an archive of the product's page) Beware the dark schemes of Roodaka! Powerful and dangerous viceroy of the Visorak, Roodaka is one of the most formidable foes any Toa has ever faced. With her catcher claws she can snag spinners thrown at her, poison them and then fling them back. Her Rhotuka spinners have the power to instantly and permanently mutate anyone they strike. A sworn enemy of the Toa and the Rahaga, she also plots against Sidorak to take control of the Visorak! New feature! Send her spinner flying up to 50 feet/15 metres! Roodaka stands over 11 inches/28 cm high! Includes building instructions to combine with #8755 Keetongu to create the Shadowed One! Roodaka once had a Nui-Kopen that she personally mutated into a ride for herself. Roodaka was voiced by Kathleen Barr in Web of Shadows, who also voiced Misako in Ninjago: Masters of Spinjitzu. The word "Roodaka" has become Matoran slang for "Treachery". Roodaka has brokered deals with the Dark Hunters and the Brotherhood of Makuta; this has put her in line for rule of Xia. In the movie Web of Shadows, Roodaka's catcher claws were depicted as a handheld staff; they were later confirmed to actually be part of her body. Roodaka appears as an enemy boss in the non-canon video game BIONICLE Heroes. Roodaka appears with a black head and orange eyes as a toy but appears with a white head and red and blue eyes in the movie Web of Shadows. This page uses content from BIONICLEsector01. The original article was at Roodaka. The list of authors can be seen in the page history. As with Brickipedia, the text of BIONICLEsector01 is available under the GNU Free Documentation License, however please help to make this a unique article to Brickipedia in any way you can. Beware the dark schemes of Roodaka!